The film company Focus Features has a nifty overview of steampunk by Jeff VanderMeer on its website for the movie "9," an animated fantasy epic that draws on the genre's language and imagery. "Over the past decade, Steampunk has gone from being a literary movement to a way of life, a part of pop culture, and a mechanism to look at the idea of 'progress,'" says VanderMeer, the co-editor of Steampunk (Tachyon, 2008), an anthology of short stories by masters of the form. "Steampunk has gained strength and momentum as it has transitioned from a 'movement' to an 'aesthetic.' A Steampunk aesthetic now permeates movies, comics, fashion, art, and role-playing games, as well as events such Maker Faire and the Burning Man festival. Media coverage from juggernauts such as the New York Times and MTV has fostered its spread through the zeitgeist." 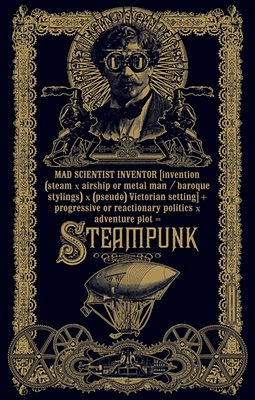 Indeed, there are now more than two dozen Steampunk iPhone apps--and counting--from games to pulp fiction.